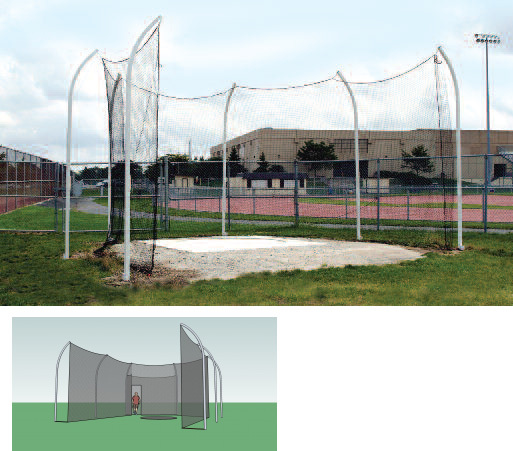 All cages are NFHS compliant and designed to the 34.92 degrees throwing sector configuration. All cages include main net and ground sleeves. 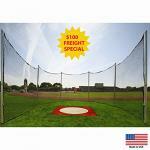 CAGE POLES Available in traditional 6 pole or 7 pole configuration. 7 pole design allows the net to extend straight forward from the sides to comply with the 34.92 degrees sector requirements while providing a less "restrictive" feeling for throwers. All poles are 14' tall 2-7/8" OD, 0.203 wall, 6063 T6 aluminum tube with rolled offset.